Wow, we’re at the last class. Crazy. I came into class with a plan of attack on how I would finish my cake. I was so nervous about all the work I had left to complete that I came in an hour early to get in some extra petal-dusting time. First up, covering my board, something nice and easy to get me into the swing of things. Then I would finish petal dusting my flowers, hopefully all of this could happen in the extra hour I had bought myself by coming in early. I hoped that by the time class was supposed to actually start I would be ready to ruffle my cake. I wasn’t really sure how I was going to achieve the look I wanted, so I knew I had to allow myself at least 2 hours to get it just right. After hour one, I had completed everything I was hoping to and was ready to start the ruffles. I measured my cake and figured out that I probably wanted each ruffle to be about 1” high, plus the stretch that it was going to get from me thinning it out. To make the ruffles, I rolled out fondant to the appropriate length. Then I cut it into a 1″ strip. I thinned out the top edge of this strip, and starting from the top of the cake, attached the first strip to the top of the cake with some royal icing. I repeated this process for all 3 ruffles down each layer of cake. The ruffles all came together with surprising ease. I had thought it was going to take me two hours to finish them, but it worked well on the first shot and I breezed right through them. 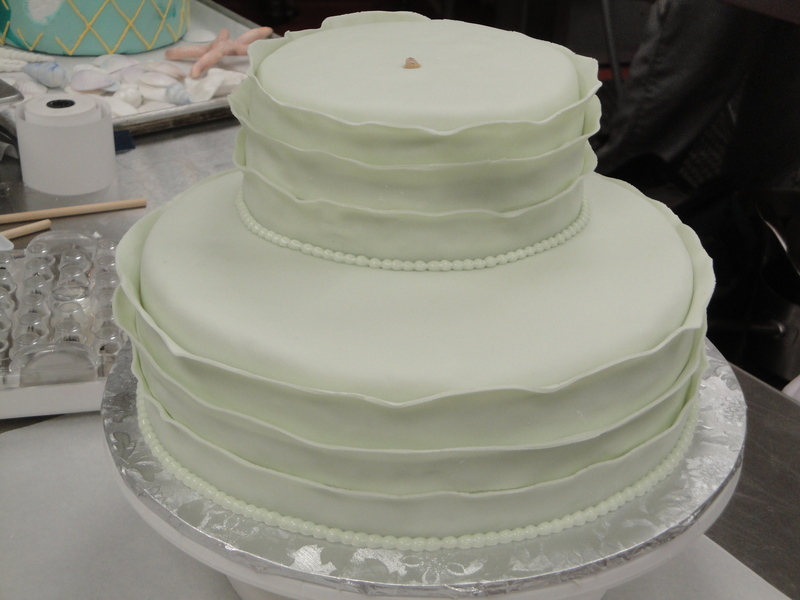 Next up, I piped around the borders of the two layers with some royal icing pearls. 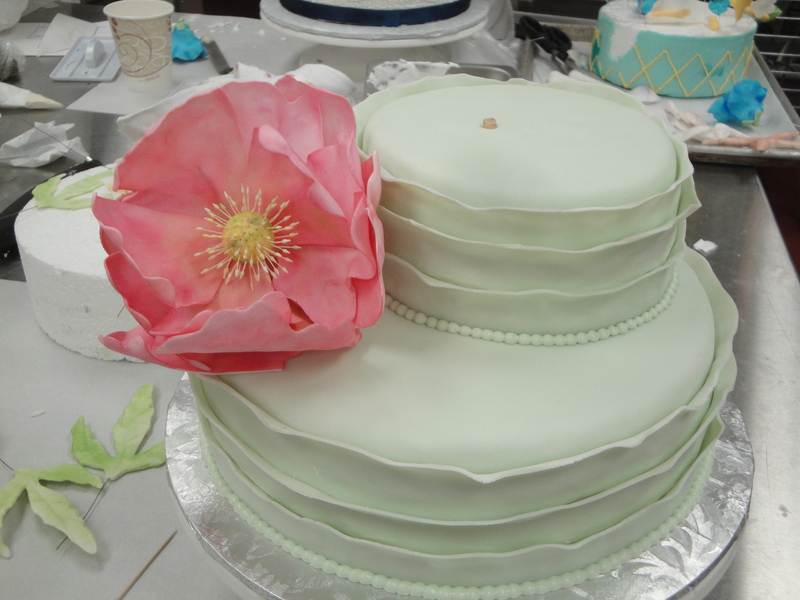 When that was done I attached the peony to the side of the cake. After that, all that was left was to figure out the top. I kept placing roses on top, but was never happy with the way it was coming out. Finally, I decided to take the roses off and placed a fondant dome on top of the cake, and then I stuck the roses into that instead. That seemed to work much better as it gave the flowers some height rather than them being stuck right on top of the cake. And with that, my last class came to an end. All 400 hours of classroom instruction was over and it was onto graduation and internship for me. I was physically ready for graduation with my cake completed, but mentally, I was not. I couldn’t believe just how quickly it had all come upon me. 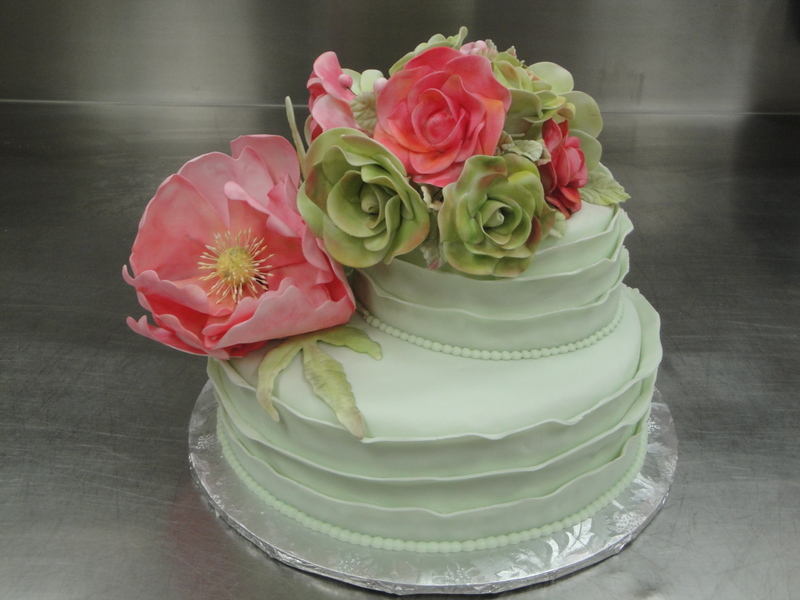 This entry was posted in cake, cake decorating, Institute of Culinary Education (ICE), pastry school and tagged cake, cake decorating, Institute of Culinary Education (ICE), pastry school by Maia. Bookmark the permalink.